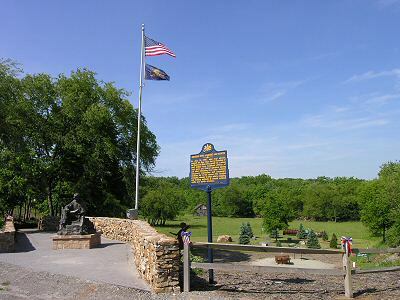 The Quecreek Mine Rescue Memorial - Monument for Life - honors and portrays the team of rescue workers who saved nine trapped coal miners from certain death near Somerset, Pennsylvania. In a larger sense, the memorial site honors the tireless heroism of rescue workers everywhere, as well as serving as a lasting tribute to the coal miners of Southwestern Pennsylvania and across the nation. The successful rescue of the nine miners drew international attention and emotion from July 24 to 28, 2002. The catastrophe and ensuing rescue captured the hearts and hopes of millions of people worldwide. The rescue took place on the 229 year old Dormel Farms, listed on the Pennsylvania Historic Registry. Since the rescue on July 28, tens of thousands of people from around the world have visited the farm, home of William Arnold and his parents Melvin and Dorcas Arnold, to view the site where the miners were rescued. This tremendous show of public interest and support prompted the Arnold family to explore the vision of developing the site into a permanent monument. To help facilitate this process, the Arnold family has created the Quecreek Mine Rescue Foundation, a non-profit, 501(c)(3), charitable organization "to preserve the site & celebrate the inspirational story of the Quecreek mine rescue." Monument for Life will be the largest permanent tribute to America's rescue workers in the United States. To learn how you can make a tax deductible contribution to the Quecreek Mine Rescue Foundation to support the Monument for Life, click here. Your support is needed to help make this tribute a reality. Thank you! The Monument for Life Memorial Park is open daily from dawn to dusk, weather permitting. We request a $7.00 per person fee for admission to the Educational Visitors Center and Memorial Park. Donate to the Monument for Life. Copyright © 2002 - 2019 - The Quecreek Mine Rescue Foundation. All rights reserved. Pennsylvania Department of State by calling toll free, within Pennsylvania, 1-800-732-0999.